Check the printer is turned on and the ink out light is off (if the printer is off or low in ink then it will not work). Open the printer status window (see instructions below). On the menu bar click Printer | Properties. The properties window will now display. Click the Head Cleaning button. Then follow the instructions found on the screen. The power light will flashing until cleaning is complete. Once cleaning is complete click Print Nozzle Check Pattern in the Head Cleaning window to confirm that the head is clean and to reset the cleaning cycle. Printer status window. Repair & delete jobs here. Click on the print job you wish to erase. In the menu bar click Document | Cancel. Power the printer off and leave off for three minutes. 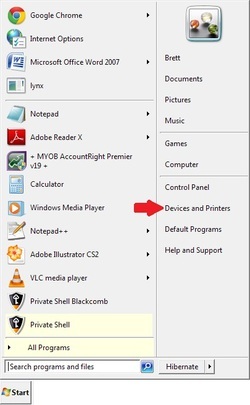 Finding the printer status window in Windows 7. Click Devices and Printers (marked in the picture by red arrow). Double click on the relevant printer icon. The printer setup window will now show. Double click the link titled "See what's printing". The printer status window will now show.